This page has been provided for the use of credentialed members of the media. Non-members of the news media are asked to call our Information Center at (714) 220-5200. Knott’s Berry Farm is happy to assist media members in producing superior news stories, programs and features that contain timely and up-to-date information. Please take a moment to browse through our Media Relations page. Note: Non-members of the news media are asked to call our Information Center at (714) 220-5200. Knott’s Berry Farm Public Relations is more than happy to assist you with setting up the perfect interview regarding the park and its attractions. Please contact the Public Relations Department to set up an interview. Knott’s Berry Farm’s Public Relations Department is able to provide assistance with both radio and television live remotes. All remotes must be arranged no less than one week prior to the remote (except for breaking news). All requests for media passes must be submitted via our Media Ticket Request Form. If approved, Knott's Berry Farm may issue up to four (4) complimentary passes per one-time visit during our calendar year. The request must be submitted no later than one week prior to your visit. Please note that this courtesy is extended to active members of the news media only and does not include office, sales or retired personnel. Proof of employment or job assignment may be required. Find the latest news from Knott's Berry Farm. The park’s popular Seasons of Fun events will kick off with the return of the newly-expanded Knott’s PEANUTS Celebration, a unique event dedicated to the beloved PEANUTS characters. Guests are invited to step inside the pages of a Charles M. Schulz comic strip as the characters take over the entire park, weekends from January 26 – March 10, 2019 and on President’s Day, Monday, February 18. As winter rolls in, the feeling of Christmas will truly be discovered at Knott’s Merry Farm, where joy will be in season from November 22, 2019 – January 5, 2020. Knott’s Merry Farm will host holiday cheer for park goers as they create new holiday memories set to the backdrop of a truly classic Christmas. A 2019 Season Pass is the best way to experience the adventures of Calico River Rapids along with an entire year of seasonal fun. With a 2019 Season Pass, guests can enjoy all of Knott’s Seasons of Fun events next year, plus one free admission in 2018. 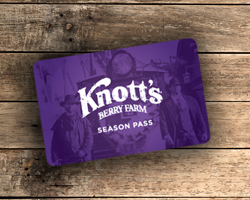 A Regular Season Pass includes unlimited admission in 2019 to Knott’s Berry Farm with no blackout dates, and a Gold Season Pass includes unlimited admission in 2019 to both Knott’s Berry Farm and Knott’s Soak City Waterpark with no blackout dates. Regular passes are now available at the lowest price of the year at $95 or eight easy payments of $10.00 after initial payment, and Gold Passes are $115 or eight payments of just $12.00 after initial payment. These offers end January 6, 2019. Applicable taxes and fees apply. Payment plans are only available at knotts.com. The celebration continues at the Calico Mine Stage where the PEANUTS characters have two musical surprises for guests. During the day Sally and Schroder will host a retrospect of music in The Music Goes Round and Round where they’ll have the audience dancing in the aisles. At nightfall, the stage will transform into a musical extravaganza as the park hosts Woodstock’s Musical Festival. The musical event will feature the Peanuts Gang joined by the family-friendly indie band The Jelly of the Month Club, performing a high energy rock concert for the whole family. While visiting Fiesta Village guests can uncover an experience that is guaranteed to make everyone dance with the park’s first ever, Discoteca de Silencio or also known as a silent disco. The fun begins with guests strapping on a set of headphones and enjoying some upbeat tunes. The party will be hosted by Snoopy’s brother Spike. It’s the most fun guests can experience while being quiet. The best way to enjoy every weekend of the all-new Knott’s PEANUTS Celebration and all of the other Seasons of Fun is with a 2019 Season Pass. A Regular Season Pass includes unlimited admission in 2019 to Knott’s Berry Farm with no blackout dates, and a Gold Season Pass includes unlimited admission in 2019 to both Knott’s Berry Farm and Knott’s Soak City Waterpark with no blackout dates. Regular passes are just $98 or five easy payments of $15.50 after an initial payment and Gold Passes are $118 or five easy payments of just $18.50 after initial payment. These offers end April 28, 2019. Applicable taxes and fees apply. Payment plans are only available at knotts.com. Looking for just the right words and word count to describe Knott's Berry Farm? Knott’s Berry Farm is a world-renowned theme park built from the humblest of beginnings nearly 100 years ago. Starting with a simple roadside berry stand, then a restaurant serving mouthwatering chicken dinners, Walter and Cordelia Knott attracted long lines of customers to their Buena Park farm. To keep crowds entertained, the Knott family built an entire western-themed town that remains the heart of Knott’s Berry Farm today. Anchored in its rich California history and charm, Knott’s Berry Farm now bursts with attractions and entertainment for all ages, including first-class roller coasters and thrill rides, elaborate stage shows, interactive entertainment, and family-friendly fun featuring Snoopy and the Peanuts Gang. To complete the family resort, the Knott’s Soak City Waterpark and Knott’s Hotel are located within walking distance of the theme park. Plus, true to its roots, Knott’s continues to serve up delicious food creations that can only be found at Knott’s Berry Farm— California’s first theme park. Knott’s Berry Farm is a world-renowned theme park built from the humblest of beginnings nearly 100 years ago. What started as a small berry farm soon began to grow into a family theme park destination thanks to famous fried chicken dinners, boysenberries and an Old West Ghost Town. Anchored in its rich California history and charm, Knott’s Berry Farm now bursts with attractions and entertainment for all ages, including first-class roller coasters, stage shows, interactive experiences, and family-friendly fun featuring Snoopy and the Peanuts Gang. Plus, true to its roots, Knott’s continues to serve up delicious food creations that can only be found at California’s first theme park. Knott’s Berry Farm is a world-renowned theme park built from the humblest of beginnings. What started as a small berry farm soon began to grow into a family theme park destination thanks to famous fried chicken dinners, boysenberries and an Old West Ghost Town. Knott’s Berry Farm now bursts with attractions and entertainment for all ages, including first-class roller coasters, stage shows, interactive experiences, delicious food creations and family-friendly fun featuring Snoopy and the Peanuts Gang. Knott’s Berry Farm is a world-renowned theme park built from the humblest of beginnings. What started as a small berry farm soon grew into a family theme park destination now bursting with attractions and entertainment for all ages, including first-class roller coasters, stage shows, interactive experiences, delicious food creations and family-friendly fun. Knott’s Soak City Waterpark is a separately gated, 15-acre water park next to the Knott's Berry Farm theme park. In 2017, Orange County's largest water park expanded 2 acres to offer even more fun in the sun with seven new slides. The park now boasts a total of 22 speed, tube and body slides plus the 750,000-gallon Tidal Wave Bay wave pool; the one-third-mile long Sunset Lazy River; and the three-story Beach House, featuring 200 water guns, nozzles, sprayers and other interactive surprises. The water park also features Gremmie Lagoon, a hands-on water playground for younger kids and families. Open seasonally on select days from late May to early September. 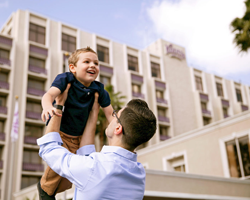 Knott’s Berry Farm Resort Hotel combines luxurious accommodations for both business and leisure. This 320-room room full service hotel features a SNOOPY-themed wing, fitness center, resort pool with children’s activity area, lighted sports courts and many other amenities. Dining options including Amber Waves, specializing in All-American fare and hotel room service. A variety of affordable family vacation packages, including admission to Knott’s Theme Park, are available year-round. For meetings and events, there is 20,000 square ft. of space, including an 8,400-sq.-ft. Grand Ballroom, corporate conference room and elegant penthouse. All located just steps from world-famous Knott's Berry Farm Theme Park and Knott’s Soak City Water Park. This 320-room room full service hotel features a resort pool, spa, fitness center, lighted tennis courts, a wing of SNOOPY-themed guestrooms, 20,000 square feet of meeting and event space and the Amber Waves American Restaurant. All just steps from Knott's Berry Farm theme park and Soak City Water Park. Located adjacent to world-famous Knott’s Berry Farm, this 320-room full service hotel features resort caliber amenities, 16 SNOOPY-themed rooms and 20,000 square feet of meeting space. Discover the rich history of Knott's Berry Farm. The Knotts' first winter on the Farm was unseasonably cold and much of their first crop was ruined by frost. But relying on his ability to make the most of what he had, Walter initiated his practice of selling directly to grocers, thus eliminating costly middlemen, and was able to realize a small profit. Walter's keen eye for sound enterprise and his dogged determination to succeed were attributes which became evident early in his boyhood years and remained solid through his life and career. His father died when he was six and by the time he was nine, Walter was raising vegetables on vacant lots, selling the produce in the morning before school and delivering newspapers in the evenings to help supplement the family income. In 1927, Knott bought ten acres of land. The Depression hit a year later and land prices dropped. While maintaining the original payments, Walter bought an additional ten acres at the lower price and spent the last of the family's savings to build an adobe structure that became the Farm's first permanent building. Ready for occupancy in 1928, the building was 80 feet long and housed a tea-room, berry market and nursery where berry plants were sold. By now, the Knotts had four children - son Russell and daughters Virginia, Toni and Marion - and, working together, they formed a family bond that prevailed throughout the years. It was not until the 1930s that Walter became associated with the "boysenberry" which would became the family trademark. Nearby, Anaheim Parks Superintendent Rudolph Boysen had experimented with a new strain of berry but the plants kept dying on the vine. Walter took the scraggly plants, nurtured them to health and named the new berry - a cross between a loganberry, red raspberry and blackberry - after its originator. Today, all boysenberries in the world can trace their roots to Knott's Berry Farm. As another means of staving off Depression hardships, Cordelia began selling jams and jellies made from Walter's berries. These were soon followed by home-baked pies, hot biscuits and sandwiches. Then, on a night in June 1934, Cordelia served eight fried chicken dinners on her wedding china - for the all-inclusive price of 65 cents each - and the world's largest chicken dinner restaurant was born. Today, the Chicken Dinner Restaurant seats more than 900 guests at a time, serves more than 1. 5 million guests each year, and is the largest full-service restaurant that serves chicken as its main course. The success of the chicken dinners was immediate and by 1940 the restaurant was serving as many as 4,000 dinners on Sunday evenings. To give waiting customers something to do and to pay homage to the pioneering spirit of his grandparents and his love of the Old West, Walter developed Ghost Town, eventually the first of Knott's Berry Farm's six themed areas. The first structure was the Gold Trails Hotel, which had originally been constructed in Prescott, Ariz. in 1868. Adhering to authenticity, Walter brought in other buildings from deserted ghost towns and Knott's Ghost Town as it exists today emerged. Additions were made as the years passed. In the 1960s, the Calico Mine Ride and Timber Mountain Log Ride were added and Knott's built its second themed area: Fiesta Village, a tribute to California's early Spanish heritage. The third themed area opened in 1975 - Roaring 20s (re-themed in 1996 into The Boardwalk) - featuring the Corkscrew, the world's first looping coaster. In 1983, Knott's debuted a first in the amusement park industry with its six-acre Camp Snoopy, the world's first theme park "land" designed specifically for kids. Wild Water Wilderness, a four-acre outdoor river wilderness area featuring the whitewater rafting ride Bigfoot Rapids, was added in 1988, followed by Indian Trails in 1993. It was also the Knotts' decision to build the country's only brick-by-brick replica of Independence Hall, complete with an exact replica of the Liberty Bell, as a free-admission educational resources for Farm guests and Orange County residents. Cordelia Knott died in 1974 at the age of 84 and Walter Knott continued to live on the Farm he loved until his death in 1981 - a week before his 92nd birthday. The Knott Family maintained operation of Knott's Berry Farm until its friendly acquisition by Cedar Fair, L.P. in December 1997. In keeping with Walter and Cordelia's original goals, Knott's Berry Farm continues to combine quality, wholesome family entertainment with nostalgia and history. Cedar Fair is currently expanding Knott's Berry Farm with the most new rides, shows and attractions in the park's history, while maintaining those simpler features that continue to make it "The Theme Park Californians Call Home®." The Knott family arrives in the sleepy community of Buena Park and begins farming 20 acres of land on Highway 39 (now Beach Blvd). The first permanent building is erected to house Cordelia Knott’s tea room and berry market. The farm is christened Knott’s Berry Place. Walter Knott begins propagating the new boysenberry plant, a curious cross between the red raspberry, blackberry and loganberry. To make ends meet during the Great Depression, Cordelia serves her first chicken dinners on her wedding china for 65 cents each. Walter and Cordelia expand their tea room into a genuine restaurant complete with separate kitchen, dining rooms and parking lots. Despite serving 1,774 dinners on Thanksgiving Day, Cordelia insists she’s still not in the restaurant business. Daughter Virginia sets up a souvenir table in the Chicken Dinner Restaurant, founding the country’s first theme park souvenir shop. In an attempt to entertain the thousands of restaurant customers lining up each day, Walter relocates the Gold Trails Hotel to the Farm from Prescott, Ariz. To the hotel’s lobby Walter adds the Farm’s first attraction: “The Covered Wagon Show,” a cyclorama depicting the Knott family’s journey West. The hotel and cyclorama form the basis for Ghost Town, the first themed area of Knott’s Berry Farm. Knott’s Berry Place is officially renamed Knott’s Berry Farm. The Calico Saloon, incorporating many of the most popular elements of old saloons throughout the West, opens serving sarsaparilla and boysenberry punch on Calico Square. Walter buys America’s last operating narrow-gauge railroad, the Denver and Rio Grande, and moves it in its entirety to Knott’s Berry Farm. The steam-powered train is christened the Ghost Town & Calico Railroad, proving a perfect addition to growing Ghost Town. Walter and Cordelia attend the July 18 opening ceremonies of Disneyland, and return to find the Farm parking lot filled to capacity. Despite rumors to the contrary, Knott’s Berry Farm continues to thrive, enjoying its best year ever. The Calico Mine Ride, an ingenious trip into the depths of an Old West mine, opens to rave reviews. Its creative use of themed and special effects sets a new standard for future Knott’s attractions. Walter completes construction on a brick-by-brick replica of Independence Hall, complete with cracked, 2,075-pound Liberty Bell. The amusement park is enclosed and a general admission fee is charged for the first time ($1.00). The Calico Logging Co. (later the Timber Mountain Log Ride) opens as one of the first log flume rides in the U.S. Fiesta Village also debuts. Knott’s transforms itself into Knott’s Scary Farm for its first-ever Halloween Haunt® the world’s first amusement park Halloween promotion. The event remains the industry standard, breaking attendance records every year. Cordelia Knott dies on April 23 at the age of 84. The Corkscrew, the world’s first 360-degree roller coaster, opens as the centerpiece of the Roaring 20’s themed area. Another highlight of Roaring 20’s is Knott’s Bear-y Tales, a fantasy dark ride featuring the Bear-y family. The 20-story Sky Jump and Sky Cabin – patterned after an attraction at New York’s Coney Island – provide a breathtaking new addition to Roaring 20’s. The new attraction helps make July 4, 1976 the biggest attendance day in Knott’s history to that point. Knott’s opens its second roller coaster, Montezooma’s Revenge, in Fiesta Village. The ride takes riders from 0 to 55 mph in five seconds. Walter Knott dies on Dec. 3 – one week before his 92nd birthday. Amusement park veteran Terry E. Van Gorder takes the helm as Knott’s first non-family president and CEO. Camp Snoopy, the park’s six-acre wonderland for kids, opens July 1 as the official home of Snoopy and the Peanuts gang. It is the first area of any amusement park designed solely for kids under 12. Knott’s Berry Farm is magically transformed into Knott’s Merry Farm as the park hosts its first Ghost Town Christmas Crafts Festival. Another dimension to Roaring 20’s is added with the opening of Pacific Pavilion, home of education-oriented marine mammal shows. Knott’s foreshadows the dinosaur craze by replacing Knott’s Bear-y Tales with Kingdom of the Dinosaurs, a trek into prehistory complete with 21 fully animated creatures and environmental special effects. The expertly timed new attraction helps make the year one of the best on record. Knott’s Berry Farm becomes only the fourth park in the world to receive the coveted Amusement Business/Liseberg Applause Award, awarded biannually to the amusement park whose management, operations and creative accomplishments have inspired the industry with its foresight, originality and sound business development. Bigfoot Rapids, an untamed journey down the longest man-made river in the West, opens in the new Wild Water Wilderness themed area. Knott’s introduces its “Adventures in Education” program, making learning “come alive” for Southern California students of all ages through in-park educational tours and school assemblies. The Corkscrew is replaced by Boomerang, a European-designed roller coaster that takes guests upside down six times in less than a minute. Ghost Town celebrates its 50th Anniversary. Knott’s opens its first off-site restaurant, Mrs. Knott’s Restaurant and Bakery, in the Southern California communities of Irvine and Moreno Valley. A third restaurant in Mission Viejo opens a year later. Indian Trails, Knott’s two-acre Native American interpretive center, debuts on the outskirts of Ghost Town. Knott’s Camp Snoopy is unveiled as the six-acre centerpiece of Minneapolis’ Mall of America, the country’s largest shopping center. Boasting rides, live shows, family attractions, shops and restaurants, it remains the world’s largest indoor themed amusement park. Knott’s serves as the host park for the International Association of Amusement Parks and Attractions (IAAPA) convention in Los Angeles. Knott’s dazzles audiences with Mystery Lodge™, a magical journey into the Native North American West and the park’s most technically advanced project ever. Knott’s Berry Farm celebrates its 75th Anniversary with a year of festivities and special events highlighted by the summer debut of Jaguar!™, The Streaking Big Cat of Roller Coasters! Knott’s re-energizes the Roaring 20’s, incorporating a score of rousing new entertainment concepts. The Boardwalk salutes the vigor, vitality and variety of Southern California’s legendary seaside culture. Windjammer Surf Racers blows onto The Boardwalk. The nation’s first major outdoor dual-track steel racing roller coaster pits jammer against jammer through side-by-side vertical loops, six story drops,dives and a spiraling finale. Cedar Fair Entertainment Company of Sandusky, Ohio acquires Knott’s Berry Farm. The acquisition puts Knott’s on the New York Stock Exchange for the first time. GhostRider, the longest and fastest wooden roller coaster in the west opens. Supreme Scream, the world’s tallest descending thrill ride debuts as Orange County’s tallest structure. Knott’s acquires the adjacent Buena Park Hotel. Upon completion of a $24 million renovation the former Buena Park Hotel is unveiled as the Radisson Resort Knott’s Berry Farm featuring 320 elegant rooms including a PEANUTS themed wing. Knott’s Southern California Resort evolves as Soak City, a separately gated water adventure park opens on a former parking lot. The 2,100 seat Good Time Theatre is renamed the Charles M. Schulz Theatre dedicated to the legacy of Charles Schulz, the creator of Snoopy and the Peanuts Gang. Replacing Windjammer, Xcelerator, a high-octane thrill ride launching riders 0-82 mph in just 2.3 seconds straight up 205 feet at a 90-degree ascent and an immediate 90-degree descent, opens in The Boardwalk Area. Russell Knott, the second eldest child of Walter and Cordelia Knott, dies at the age of 86. Knott's Berry Farm’s alter ego, Knott’s Scary Farm, celebrates the 30th anniversary of Halloween Haunt®, the amusement industry’s first ever and longest running Halloween themed event. Camp Snoopy, home of Charles Schulz’s lovable beagle, Snoopy, and the rest of the PEANUTS gang, celebrates it’s 20th Anniversary at Knott’s Berry Farm. In honor of this anniversary, the all-new Camp Snoopy Theatre opens as the new home of the Peanuts gang’s musical variety shows. Snoopy’s alter ego, Joe Cool, gets his own new ride, Joe Cool’s GR8 SK8, the fifteenth attraction in the six-acre children’s area. Rachel (Toni) Knott Oliphant, the third child of Walter and Cordelia Knott, dies at the age of 86. Virginia Knott-Bender, the oldest child of Walter and Cordelia Knott, dies at the age of 90. Four new attractions make their debut at Knott’s in 2004. RipTide - a soaring, spinning thrill ride with 720? of attitude makes waves in The Boardwalk; Lucy’s Tugboat sets sail in Camp Snoopy; and Screamin’ Swing pushes riders higher than mom or dad ever could. And on December 7, Silver Bullet® streaks into Knott’s. The $16 million suspended coaster sends its riders upside down six times through a cobra roll, outside vertical loop, corkscrews, and flat spins all while travelling under 3,125 feet of steel track! America’s oldest themed amusement park proves once again its commitment to enhancing the guest experience by announcing plans to add a new water attraction and restaurant. Recently ranked as one of the top family-friendly restaurants in markets across the United States by Citysearch, Johnny Rockets® takes up residence at America’s most family-friendly theme park, Knott’s Berry Farm. Known for it’s all-American diner look and feel, Johnny Rockets® offers delicious food, swinging servers and great jukebox music. Knott’s debuts its first spinning coaster, Sierra Sidewinder which take guests through banks, turns and dips all while rotating on its axis! Located at the entrance of Camp Snoopy, this coaster put a whole new spin on fun. Knott's Berry Farm sets out on a mission to deliver “First Class” thrills with the opening of their coaster, Pony Express, which arrives in Ghost Town on Memorial Day Weekend. Named after the famous Pony Express which promised a faster mail service on the North American continent, Knott’s Pony Express sends guests on a horseback relay at speeds never imagined in the Old West! Mrs. Knott’s Chicken Dinner Restaurant, a Southern California dining institution celebrates its 75th anniversary in 2009. This world-famous restaurant offers the same legendary multi-course meals and warm neighborly atmosphere that have kept tourists, locals and celebrities coming back since 1934. Today, Mrs. Knott’s Chicken Dinner Restaurant serves an average of 1,000 chickens daily, making it the world’s largest, full service, single location chicken restaurant in the world with seating for 1,000 in eight separate dining rooms. Continuing the tradition of offering fantastic food at affordable prices, Knott’s welcomes the world famous Pink’s Hot Dogs to the Marketplace shopping and dining area. A part of LA culture for over 70 years, Pink’s has long been a destination for hot dog lovers everywhere. To celebrate the Peanuts 60th Anniversary, Knott’s Berry Farm debuts a new nighttime light show that showcases the Peanuts Gang and reminds us why our heart still belongs to good ol’ Charlie Brown. Camp Snoopy comes alive with a continuous light show filled with Peanuts’ three dimensional figures, themed music, sound effects, voice-overs and colorful projections of the Peanuts’ characters. In “Snoopy’s Starlight Spectacular” guests will see their favorite characters in scenes that personify them – Lucy’s dream of being a Hollywood starlet, Schroeder’s musical genius, even Woodstock gets into the act as he and Snoopy go on a camping adventure. Knott's celebrates the 60th Anniversary of the Ghost Town and Calico Railroad with a Golden Spike Ceremony and the re-naming of engine 41 to the "Walter K." after Knott's founder Walter Knott. Walter and Cordelia's only living offspring, Marion Knott, is in attendance and christens the engine with boysenberry juice. 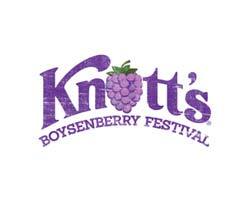 Knott’s introduces Knott’s Berry Bloom, a new season of fun that celebrates the spring with a variety of new offerings. The Search for the Easter Beagle scavenger hunt invites kids to scurry across the park to find Snoopy, and Peanuts’ Party in the Park gets everyone dancing in the streets in a new interactive live musical revue. Perilous Plunge closes permanently so construction can begin on exciting new attractions in the re-imagined Boardwalk area. This multi-million dollar undertaking includes a family coaster named Coast Rider, Surfside Gliders, on which riders pilot their own two-person aircraft for a scenic view of Boardwalk Bay, and the return of the classic Pacific Scrambler. 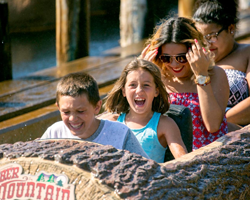 The Timber Mountain Log Ride, a beloved Knott’s attraction and one of the oldest log flume rides in the country undergoes a massive refurbishment. The restoration upgrades all of the ride figurines and sets and brings new scenes and characters to the enhanced ride experience, while still maintaining the original theme and storyline of the attraction. In celebration of 30 years of Camp Snoopy, Knott’s Berry Farm revitalizes the entire land of the High Sierra fun and adds three new attractions: Charlie Brown’s Kite Flyer, Pig Pen’s Mud Buggies, and Linus Launcher. The Calico Mine Ride – Knott’s Berry Farm’s first major ride was restored with over 50 new animatronics figurines, new audio, themed lighting system, plus a few startling new special effects. The enhancements breathed new life into the park’s landmark attraction. Marrion Knott, the youngest child of Walter and Cordelia Knott, dies at the age of 92. Voyage to the Iron Reef™, a spectacular new interactive 4-D ride opens on May 15, 2015. Guests who have what it takes to become brave deep-sea navigators climb aboard submarine-inspired ride vehicles and embark on an adventure into the Iron Reef that combines the fun of a theme park ride with the interactivity of high tech video games. Riders aim their freeze rays at the Kraken Queen’s army of menacing sea creatures and compete against each other to blast the highest score and save Knott’s from a watery doom. In honor of Ghost Town’s 75th, Knott’s Berry Farm debuted Ghost Town Alive!, the new, interactive, limited-time celebration that allows guest to live the Old West and become the main character in this unique experience. Guests play an active role in shaping the events of the day were different adventures will unfold through the familiar town of Calico. GhostRider, the longest, fastest and tallest wooden roller coaster on the West Coast, returns from a major restoration project with all-new trains that gallop along over 4,500 feet of new track. Knott’s Berry Farm debuts Sol Spin a brand new hair-raising thrill to the Fiesta Village area of the park. Sol Spin sends brave guests on a thrilling topsy-turvy adventure over 6 stories high as they rotate in all directions on one of six spinning arms. Knott’s Soak City expands to include 2 new water slide towers geared for families and thrill seekers. Shore Break towers over seven stories and offers six different thrilling water slide experiences. Four of the slides on the tower will feature an Aqua-Launch chamber which innovatively launches guests as the floor under their feet drops them into an almost vertical free fall through a series of flat loops and S-curves in a translucent flume. Shore Break also features dueling tube slides that will zip riders through an enchanting series of drops and turns. The Wedge slide tower is an open-air family raft ride. Up to six guests at a time will descend down navigating twists and turns and unexpected drops. This summer Knott’s Berry Farm will welcome HangTime, the first and only dive coaster in California. The brand new coaster will tower 150 feet over the Boardwalk area, showcasing gravity-defying inversions, mid-air suspensions and a beyond vertical drop- the steepest in California. HangTime will ascend 15 stories up a vertical lift hill and come to a halt leaving riders suspended at the crest for several seconds before descending down a 96-degree drop, through 2,189 feet of steel track and five thrilling inversions. Catch HangTime at Knott’s Berry Farm beginning May 18, 2018!